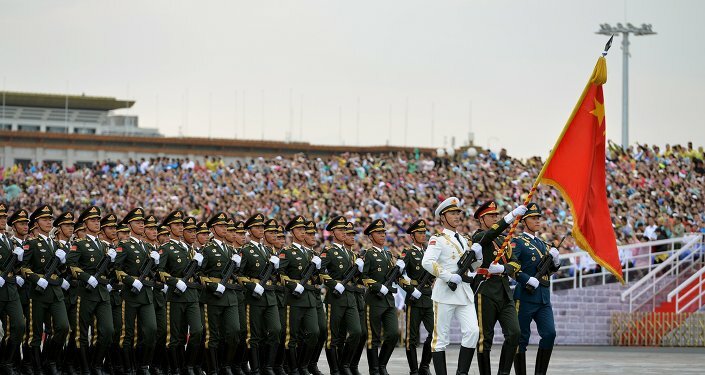 Russian President Vladimir Putin has arrived at the military parade in Beijing which marks the 70th anniversary of China’s victory in the War of Resistance against Japan and the 70th anniversary of the end of World War II. BEIJING (Sputnik) —Putin was the last to arrive at the commemorative event on Thursday and walked to the stands together with Chinese President Xi Jinping, who welcomed his international guests. The Russian President, who came to China on Wednesday, attended a formal dinner hosted by the Chinese leader prior to the parade. Leaders and senior officials from dozens of countries and international organizations, including UN Secretary-General Ban Ki-moon, presidents of North Korea, Egypt, Czech Republic, Kyrgyzstan, Tajikistan and Uzbekistan also arrived in the Chinese capital to take part in large-scale celebrations. Japan’s Prime Minister Shinzo Abe, along with several Western leaders, has declined the invitation from China. China is one of the key Russian partners in various fields, including the energy sector, as well as economic and military-technical spheres. Beijing and Moscow have been particularly boosting their cooperation amid Western sanctions imposed against Russia over Moscow's alleged involvement in the Ukrainian crisis. On May 8-9, the Chinese President was on his visit to Moscow to attend the Victory Parade dedicated to the 70th anniversary of the end of World War II and to hold talks with the Russian President.